Albert Roullier Art Galleries, Chicago. Claire Dux Swift, Chicago (acquired from the above, January 1943). Private collection (by descent from the above). The Comité Marc Chagall has confirmed the authenticity of this work. The present painting first passed through the New York gallery of Pierre Matisse, one of the twentieth century's foremost modernist dealers and supporters of Chagall's work. Their shared history dates from December 1924, when the 24-year-old Matisse arranged Chagall's first solo exhibition in France at Galerie Barbazanges-Hodebert. In 1941, when Chagall left Europe in exile, it was Matisse who met the artist and his wife Bella at the dock on their arrival. Shortly thereafter, he put the couple up in rooms in the Fuller Building on East 57th street, where his gallery was located, and negotiated an exclusive contract with the artist starting at $350 per month as of October of that year. Matisse sold L'heure bleue to Claire Dux in January 1943 for $285--later that year, owing to steady sales, Chagall's monthly payment was raised to $500. Mrs. Dux was an opera star of distinction in the early 20th century, making her professional debut in Cologne in 1906. In 1921 she moved to Chicago and joined its Civic Opera, where she remained for the rest of her career. Five years after relocating, she married her third and final husband Charles H. Swift, son of the founder of Swiss & Company. Owing to Dux's musical interests, the work was sold to her under the imaginative title "The Spirit of Music." 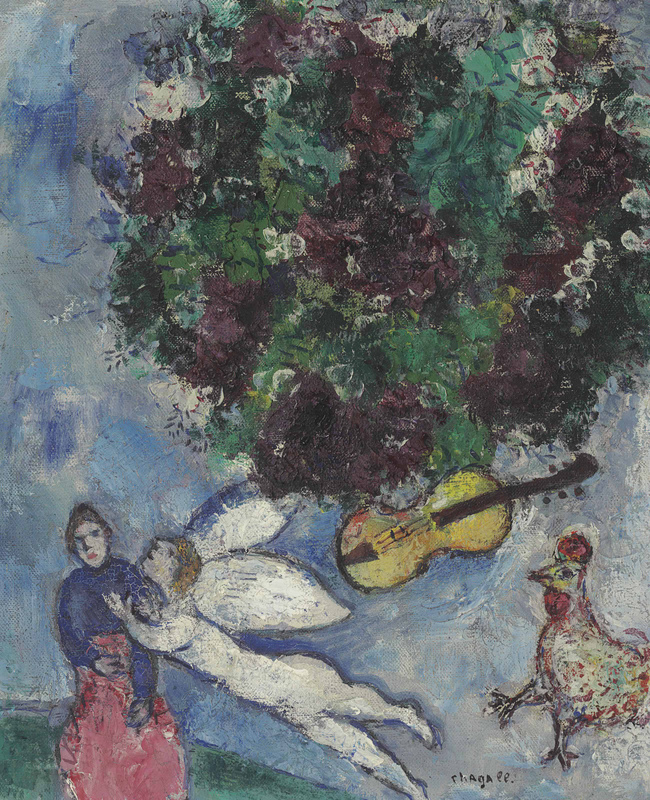 Dux was among the more intrepid of Chagall's early American audience. On the occasion of the artist's first "blockbuster" show at the Pierre Matisse Gallery in 1941, acceptance was by no means universal. As critic Henry McBride wrote, Matisse was peppered with questions: "Why was the peasant's head cut off, why was the peasant floating in the air, why, why, why, &c... Now does this not seem unfair... A musician may improvise, may dream and distort, but a painter musn't do these things. How do you account for this injustice? It is merely that the American ear has been better instructed than the American eye" (New York Sun, 28 November 1941). Dux's eye and ear were well attuned. (fig. 1) Pierre Matisse with the artists featured in his March 1942 exhibition, Artists in Exile. Matisse is front row, center; Chagall is the second from the right, between Max Ernst and Fernand Léger.